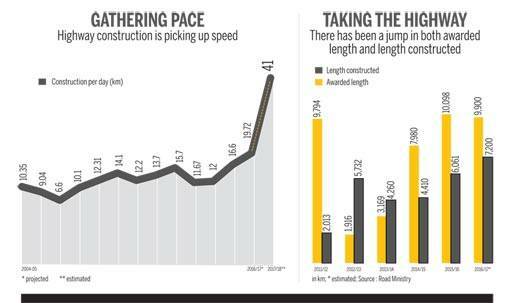 Highway construction in India hits a record high but is still a long way off the governments ambitious target. On December 31, 2015, Prime Minister Narendra Modi laid the foundation for upgrade and widening of the 105-km Delhi-Meerut Expressway. The road will reduce the travel time between the two cities to less than an hour. The `6,700-crore project envisages widening a large chunk of the existing highway from eight to 14 lanes; a part of it involves building a new road. Eager to show its result-oriented approach and differentiate itself from previous governments, the road ministry set an ambitious completion target of March 2018. However, land acquisition problems (the expressway passes through some of the most congested stretches in the National Capital Region) and litigation (a construction company left out of a tender went to court) slowed progress. The prime minister reportedly gave a dressing down to officials in November last year. Now, Cabinet Secretary P.K. Sinha is monitoring the project, running late by nine months. Things have come to such a pass that the National Highways Authority of India, or NHAI, has stopped giving any deadline for the project. Building roads is one of the most visible ways to show progress. When the United Progressive Alliance, or UPA, was re-elected in 2009, road transport minister Kamal Nath had increased the highway construction target 10-fold to 20 km per day. He could manage just 12-13 km a day. 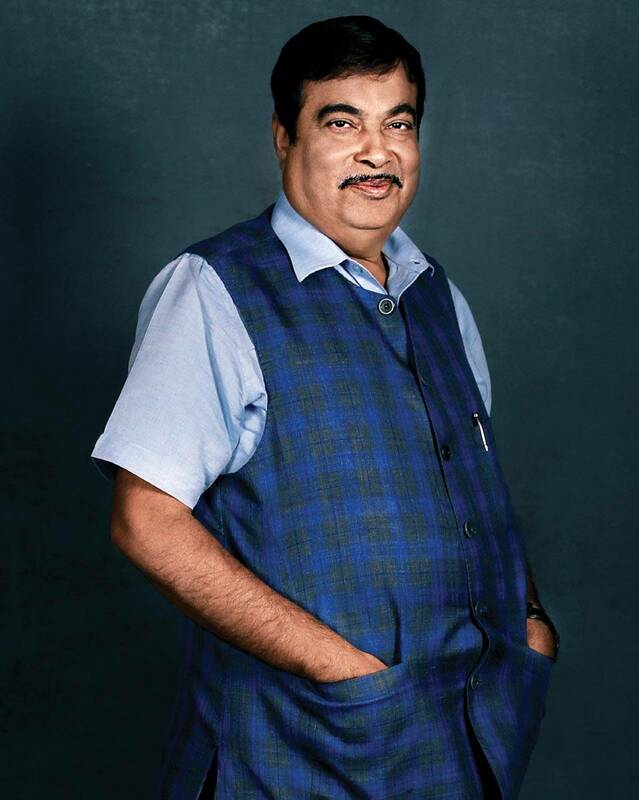 The current minister, Nitin Gadkari, had set an ambitious target of 41 km per day by 2016/17. Though more roads and highways are being built in India today than ever before, the current pace - of close to 20 km a day - is a far cry from what the minister has promised. The biggest problems, just like in case of the Delhi-Meerut project and projects under the previous governments, are fundamental - land acquisition, litigation, and financial viability of models under which the projects have been bid out. In spite of Gadkari's initiatives - such as introduction of new bidding models under which the government shares a bigger risk and burden - and his success at increasing the pace of projects, will history be kinder to him than it was to Nath? Only a wee bit, it seems. When the National Democratic Alliance (NDA) government came to power in mid-2014, the roads and highway sector was not in the best of shape. Highway construction had slowed to 12 km per day. The pace of awarding projects was also decelerating sharply. The UPA government had gone on an overdrive between 2010 and 2012 and awarded more than 20,000 km of highway projects. Many were shelved due to poor planning. A few other projects inherited by this government were delayed by more than three years. The prevalent public private partnership (PPP) model of build, operate and transfer, or BoT, had failed, investor confidence was low, and bankers were averse to funding highway projects. The sector needed an overhaul. "A large number of projects were awarded between 2009 and 2012 after acquisition of only 30-40 per cent land. As a construction agency, how much working front is available is important for timely completion of projects," says NHAI Chairman Yudhvir Singh Malik. "The problem needed to be solved immediately." To get things going, the government increased investment from its own pocket. Most projects awarded in 2014/15 and 2015/16 were under the Engineering, Procurement and Construction (EPC) route, where financial liability rests solely with the government. This was after the bad execution record of companies that had taken projects under the BoT route. In the BoT model, companies end up taking most of the risk. Then, keeping in mind the financial burden on the government under the EPC system, a new hybrid annuity model (HAM) was devised. In a departure from other PPP models, under HAM, the private investor has to bear 60 per cent project cost, which in turn is paid by the government through annuity payments from the date the project is commissioned. The balance 40 per cent cost is also met by the government during the construction period. "The environment has improved dramatically with the number of projects under EPC and HAM rising manifold. The switch from BoT to HAM has helped developers and is a big comfort for bankers," says Arun Lakhani, Chairman and Managing Director, Vishvaraj Infrastructure Ltd. "In the BoT model, traffic estimation and future projections were critical. Banks were not comfortable with this due to possibility of an alternative route materialising. In HAM, the traffic risk is taken away from the entrepreneur, making it safer for bankers." With bankers becoming comfortable, new developers, big and small, have mushroomed. Increased transparency and improvement in the tender process have also helped. "This government has worked hard in untying the many knots that have stifled this sector for long. 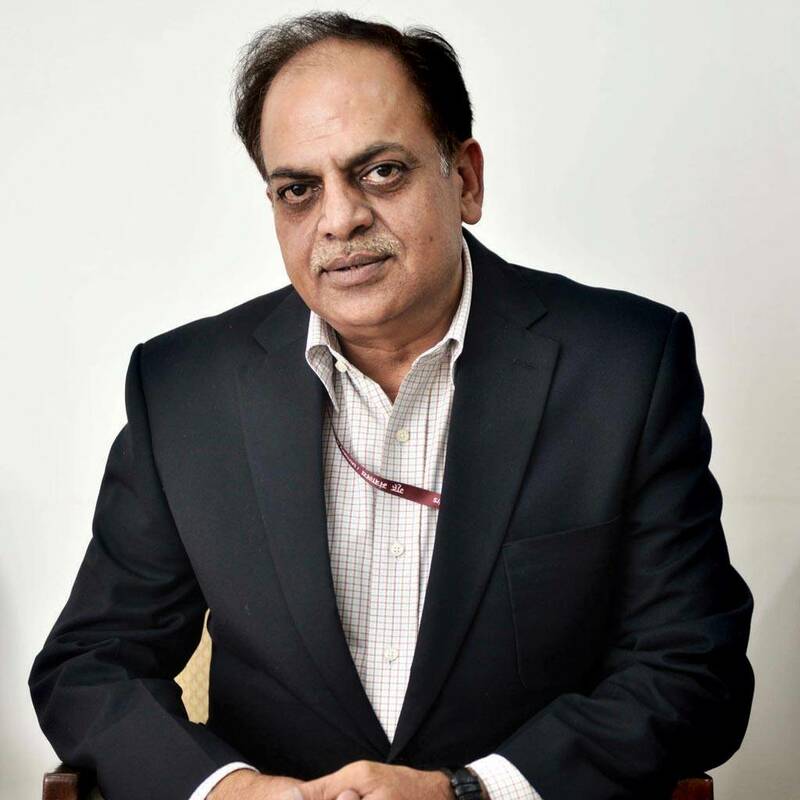 A lot of innovative schemes have been launched, which has brought back investors," says Vinayak Chatterjee, Chairman, Feedback Infrastructure Services Pvt Ltd. "The sector has not been rid of all its problems but this is perhaps the best time for new entrants. Many new companies that are family run, tightly managed and not from big cities have bagged several projects in the past 18 months or so." "There has been a material improvement in pace of awarding and execution of projects and reduction in delays in projects awarded after 2012/13. For example, the NHAI had built 25 per cent more in terms of length this financial year as of December 2016," says Ajay Srinivasan, Director, Industry Research, CRISIL Research. "We estimate that due to several policy reforms, investment in national highways will grow 3.2 times in the next five years (FY17 to FY21) compared to the previous five years." In 2016/17, India is expected to add 7,200 km highways. This comes to 19.72 km per day, the highest ever in a single year and a 19 per cent increase over 2015/16. Freshly awarded stretches would be a healthy 9,900 km, a shade less than in 2015/16. While these numbers are impressive, they are well short of the targets. At the start of the year, Gadkari had said 15,000 km fresh highways would be built during the year. The bar for fresh contracts was set at 25,000 km. Some experts blame it on unrealistic expectations. The 2016/17 targets were 150 per cent more than the 2015/16 targets. Such growth is unheard of in core sectors. Even the minister admitted the target was steep. "The target of building 41 km per day was always very ambitious. I had deliberately set it as an aspiration," says Gadkari. "I am still hopeful. By end of this fiscal, we should achieve 30 km per day and next year we will definitely achieve 40 km per day." Experts say this is wishful thinking, as the biggest hindrance to speedy execution of any big road project, land acquisition, has not been removed. "The standard operating procedure for acquiring land for an infrastructure project assumes a time frame of 18 months. When the NDA came to power, it was as high as 60 months. It has been brought down to 33 months," says a joint secretary in Gadkari's ministry. "We have probably brought it as low as possible. Doing it quicker will be a herculean task," he says. To expedite the process, the government had increased the compensation under the Right to Fair Compensation and Transparency in Land Acquisition, Rehabilitation and Resettlement (Amendment) Ordinance, 2015, from `1.35 crore per hectare in 2014/15 to almost `2 crore per hectare in 2015/16. As a result, the NHAI paid a record `19,020 crore compensation for 9,285 hectares in 2015/16 as against `9,098 crore for 6,733 hectares in 2014/15. 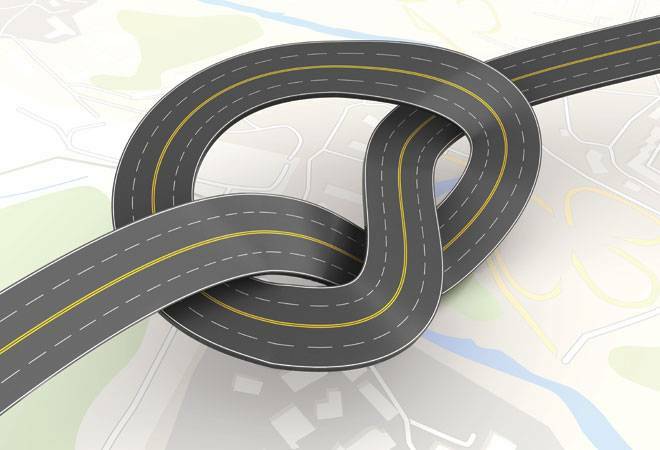 To streamline the process, guidelines for setting up special cells in the ministry, regional offices, NHAI, National Highways and Infrastructure Development Corporation and their project implementation units were issued. Instructions were also issued for appointment of additional CALA (competent authority for land acquisition) or arbitrators to ease their workload. Additionally, a decision was taken for bulk purchase of land. "The guideline that projects will start only after 90 per cent or more land is available has helped a lot. So has the higher compensation. However, the process is still a long-drawn affair. Some amendments in the legal process may bring more efficiency in land acquisition," says Lakhani of Vishvaraj Infrastructure. "For our recent Chilhali-Tarsod project on NH-6, 90 per cent land was made available. However, our earlier L1 project, given by the Maharashtra PWD, Chandwad- Manmad, has been struggling due to land problems for three years." Even Gadkari seems helpless at times. In many cases, such as the Delhi-Meerut expressway, the slow pace of judicial proceedings means the project may drag for years on end. "The sector is moving very fast. Budget and finance is not a problem anymore. But we are suffering due to slow decision making and red tapism," he says. "What is the cost of delays in land acquisition and environment approvals? I am sure it is huge. If we have to convert a BOT into an EPC project, there is no response (from concerned departments). So we need to strengthen the NHAI and give it more powers." The changes are clearly not happening fast enough for him to achieve his targets. "Land acquisition continues to be one of the main bottlenecks. A detailed project report from the consultant will go a long way in providing clarity from the onset and preventing unnecessary back and forth and delays," says C.K. 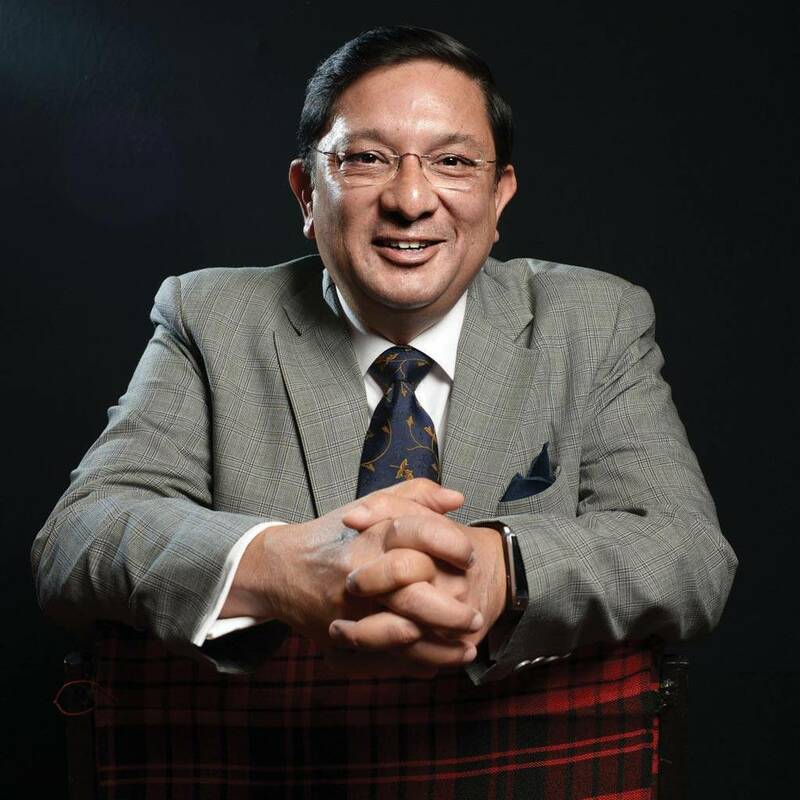 Thakur, President and CEO, Power and Buildings & Infrastructure, Punj Lloyd. "We were entrusted with rehabilitation and upgrade of four laning with paved shoulders of 50 km of the Talebani-Sambalpur section of NH-6 in Odisha in January 2016. We have not made satisfactory headway due to lack of land availability." The slow pace of land acquisition has been a major cause for delays. In 2015/16, the NHAI had identified 70-72 projects as languishing - projects where the construction agency had wound up operations and stopped work. Some had to be terminated, while in others, funds were injected. It claims the number of languishing projects is now just nine. Further, 102 projects are delayed. The NHAI says it will bring down the number by 50 per cent by March next year. Any delay in land acquisition leads to cost escalation and threatens viability. The Eastern and Western Peripheral Expressway to de-congest the national capital by creating a by-pass for non-Delhi-bound traffic is an apt example. The 270-km loop, under construction since 2006, required 200 sq km land. In 2008, the cost was estimated to be `800 crore. Delays pushed it to `1,600 crore before a new land acquisition Bill, passed in 2013, stipulated fresh compensation for land owners. The cost ballooned to `6,000 crore, an over seven-fold increase over the initial cost. The government would be judged as much by statistics - length of new roads - as by the fate of its signature projects. When the NDA came to power in 1999, the Atal Bihari Vajpayee government gave the sector the much-needed boost by launching the golden quadrilateral project that connects the four metropolitan cities. This time, there is no unique overarching project, but Gadkari has promised a number of high-speed access-controlled expressways. Some, such as Delhi-Jaipur, Bangalore-Chennai, Delhi-Ludhiana, Nagpur-Mumbai, Vadodara-Mumbai, Kolkata-Dhanbad, Delhi-Amritsar-Katra and Mumbai-Goa, will be closely watched. While work has started on most of these projects, a large number of them will spill beyond 2019. "Executing any project in India is a nightmare. There is widespread encroachment along roads, so even widening a two-lane highway into a four-lane highway is not easy," says Malik of NHAI. "Somebody will set up a shop or a temple along the road and you can imagine the difficulty in removing it. We are now entering a phase where the land acquisition cost is in most cases higher than the civil construction cost. It used to be 20-25 per cent of the cost but now it is 50-60 per cent." To avoid an overhang of delayed projects, as in the past, the NHAI, which develops nearly 60 per cent highways in the country, has decided to announce the appointed date of only those projects where at least 80 per cent land is available. That could mean a slowdown in awarding of projects in the short term. "In fact, I want to take it up to 90 per cent," says Malik. "It is possible that I may be a laggard (in awarding projects) for six months. But if I first remove hindrances and then announce the date, the execution time will be less and so will be the disputes and claims of construction agencies against me. It is a better way to function." Like the Meerut-Delhi expressway, the Eastern and Western Peripheral highway and many such roads in India that never met their first deadlines, perhaps Gadkari would have to shift the time frame for his target as well. At least that would be better than not achieving them at all like his predecessors. If he manages to do that, he would have achieved the impossible. "We can clear the patent backlog within next two years"